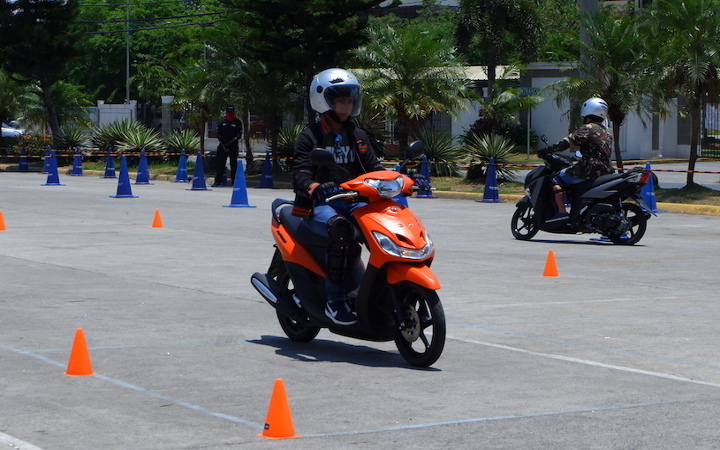 “Dapat nandoon pa rin po ang ingat sa pagsingit-singit,” Yamaha safety instructor DM Guevarra repeatedly cautioned the group of 15 intermediate riders sitting before him. 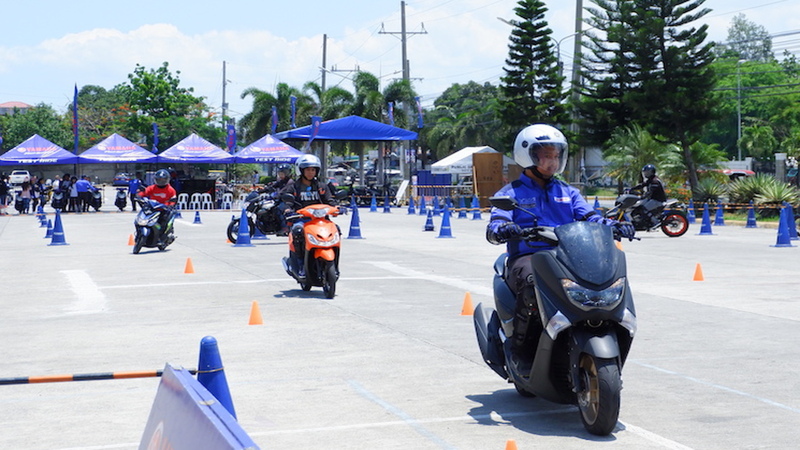 On April 14, 2019, the last leg of the three-day Yamaha Revfest in Calamba, Laguna, Guevarra conducted a lecture about riding safely, particularly about the mindset to adopt when in gridlock. 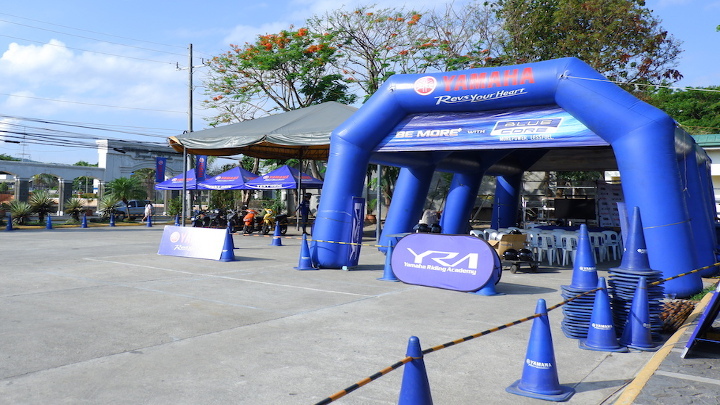 Yamaha Motor Philippines has been holding free one-day riding clinics (for complete beginners and experienced riders alike) throughout the country under the Yamaha Riding Academy (YRA) program. 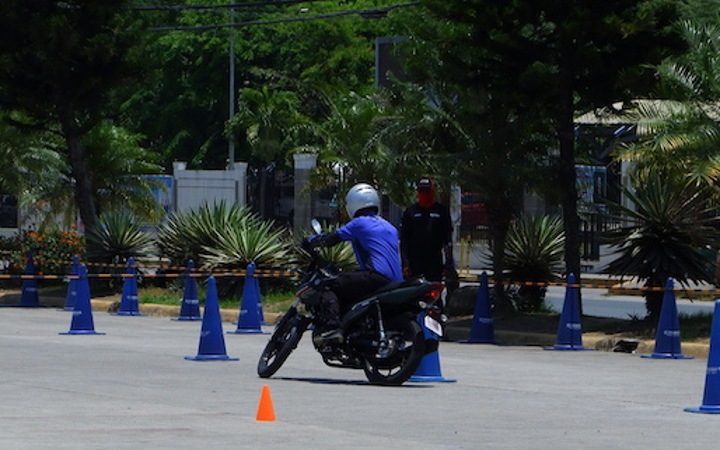 The company’s ultimate goal: maximize the fun of motorcycles and lessen risk by teaching useful skills and proper awareness. Remember when a young Haley Joel Osment whispered, “I see dead people”? 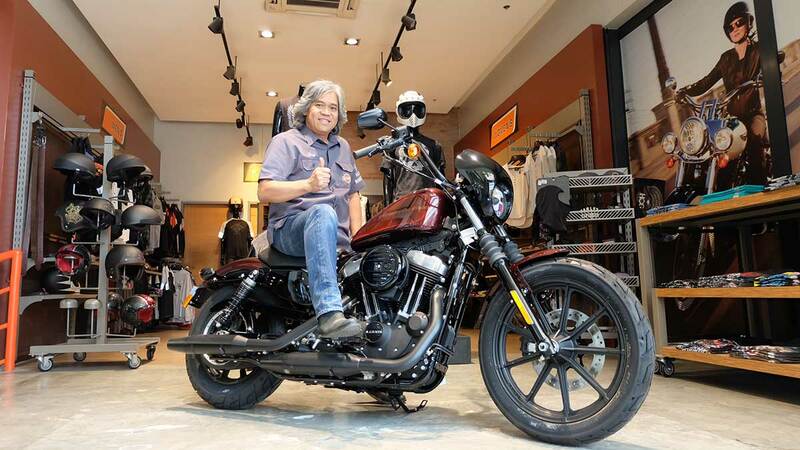 As a motorcycle rider, that’s what you want to have—well, a sixth sense for sniffing out road dangers, not ghosts. You’ve probably already picked up on a few patterns: the erratic lane changes of an impatient driver or rider, the blinking hazard lights of a lost or parking car; the super-wide sidewalk-to-sidewalk U-turn, the half-run, half-walk gait of a jaywalker. 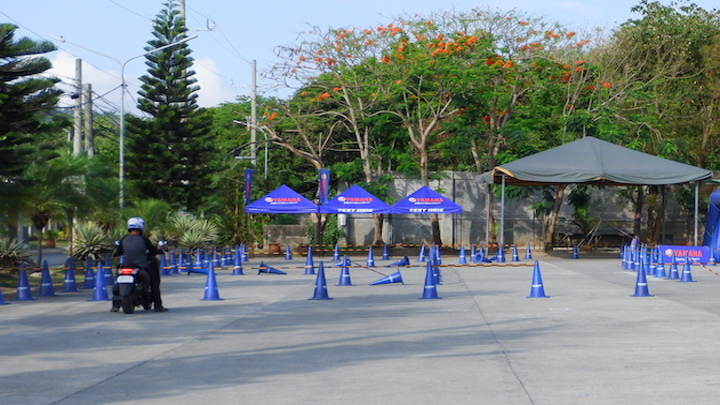 Filipinos use roads very creatively. The more creative the examples in your library, the better you can prepare and avoid accidents. Which brings us to the next point. 2) Reaction time requires focus. The brain can process and piece together information from entire images in about 100 milliseconds. That’s faster than a blink. But it can’t figure out how to deal with a fast-approaching rear bumper if you’re busy daydreaming about rainy weather and a piping hot bowl of bulalo that would be just perfect with a cup of rice and some spicy patis and calamansi dip. Focus! That bulalo, like the rains, is not yet on the horizon. 3) Blind spots are larger and wider than they seem. Experienced motorcycle riders know it can sometimes be difficult to see the road the way other drivers see it. We can theoretically see more of the road because we don’t have door panels, roofs, pillars, and hoods blocking our view. As an example, the blind spots of a sedan typically include the areas slighty behind the driver seat, beside the rear passenger doors, and near the car’s rear bumper. These blind spots get larger with SUVs and vans. And because their driver’s seat is so high above the road, buses and trucks have the added disadvantage of not being able to see motorcycles that are right beside, in front of, or behind them. The best safety practice is to assume that the drivers near you cannot see you at all. That way, you won’t be surprised when someone finally does cuts you off. 4) Choose an appropriate helmet. Reputable helmet manufacturers go to great lengths to let you know just how safe their helmets are. Most of the time, you can find out if their helmets are DOT-, ECE-, or Snell-rated by checking the back for decals or looking at the chin straps for printed labels. 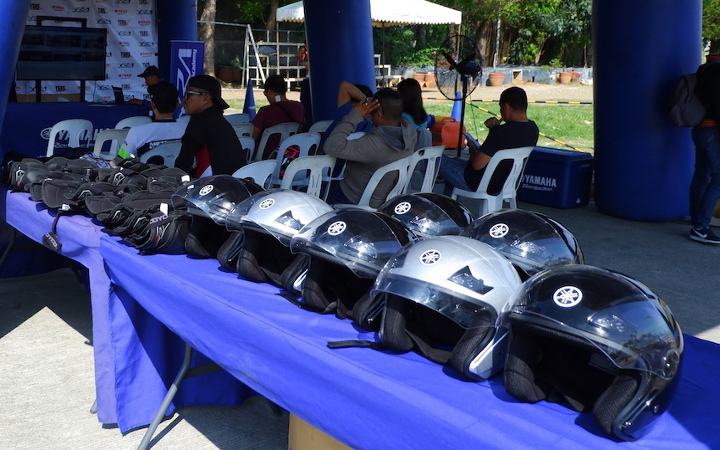 The minimum requirement for an LTO-approved helmet is the presence of either a Philippine Standard (PS) or Import Commodity Clearance (ICC) mark/decal. To play it safe, avoid buying lids from bangketa sellers and go directly to authorized dealerships and distributors. Once in a store, try out the model you want and inspect the shell, liner, and padding for quality. A helmet fits you properly when you can still stick your index fingers between the helmet’s liner and your temples, and fit two fingers in between your chin and the chin strap. A relieable and properly fitting helmet will keep you protected for five years. But if you do crash, throw your helmet away. It might look fine on the outside, but the foam inside is already compacted. Compacted foam basically equals zero protection. Lastly, leave construction and bicycle helmets to workers and cyclists, and don’t buy a used helmet unless you’ve seen each and every time the seller has used it. Always coming wide out of turns? Chances are you’re not slowing down enough before turning or looking ahead far enough to where you want to end up. This is one of the fundamentals that racers touch on when then say “slow in, fast out.” Also, look into the turn and point your chin toward that direction. If you’ve kept these habits up since the time you started riding, congratulations, you’re one (of the few) diligent students around. If you haven’t, we can all use some practice. Keep hydrated and ride safe!